Recently we became Orthodox Christians. It’s been quite a journey as we experienced all kinds of different services: hours, royal hours, vespers, divine liturgy, vesperal divine liturgy, matins, festal matins, pre-sanctified liturgies, bridgegroom matins, agape vespers and I’m sure I’ve forgotten some. Sometimes the services are quite long; always they are quite beautiful. I’m grateful that my daughter enjoys the Orthodox services and takes all the services in stride. Canning service? Sure why not. Maybe it’s a service to bless the jam. I took another walking tour through some more of the TOS Review Crew blogs this week. It took me a little longer this week since the sun actually came out and I spent less time on the computer and more time outside. Special thanks to Debbie at Debbie’s Digest for the above image. I’m enjoying getting to know some new blogs. Here are the ones I visited this week. 1. Chubbycheeks at Second Star to the Right and Straight On Till Morning – I liked how she had book images along the sidebar. Seeing the books reminded me of when my girls were little. Such fun books! 2. Amanda at Surviving The Testosterone – Amanda is the mom of 3 boys. I enjoyed her sense of humor and laughed out loud when reading her posts. 3. At Family Style School, I found a really neat idea for a snack basket! 5. While reading Andria’s blog: 1628 The Story of The Goebels 5, I found a really interesting recipe for a layered casserole. I think I’m going to have check back for more recipes. She also shared about making yogurt. I’ve not tried making yogurt but Andria may tempt me! 7. I really enjoyed April’s Word Filled Wednesdays posts at Homeschooling (and then some!). She has chosen some wonderful images and verses for those posts. 8. You do NOT want to be eating or drinking when reading April’s posts at Heartfelt Homeschooling. That is unless you enjoy spewing on your monitor. Though she has some serious topics on her blog (such as plagerism) I was thankful I was not eating or drinking when reading about the kitten named Lily. 9. We have quite a few ladies named April on the crew this year. And quite a few using Sonlight as well. Apryl @ following Him home has been blogging about Core 5 which is my favorite Sonlight Core. Next week I’ll take another Blogwalking Tour through the Crew! Heidi at Reviews & Reflections asked two Disney questions this week in her Disney Meme. 1) What is your favorite Disney Pixar Film? um, whatever is the most current? Really, we have loved all of them and I have no doubt we will also enjoy Toy Story 3. Each time a Disney-Pixar movie is released (or at least by the time we own it on DVD) it has become our family favorite…at least until the next one arrives. 2)Have you had opportunity to meet any of your favorite Disney-Pixar characters at a Disney park? Yes! In November 2008 Super Girl was granted her wish through Make-A-Wish. She wanted to go to Disney World so that she could meet Buzz Lightyear. Make-A-Wish made all the arrangements for us to go to Disney World but we were on our own for meeting characters. (We had a “magic wand” that did facilitate easier meeting) We did not have a clue about how to go about finding Buzz. We knew we wanted to have lunch at Pizza Planet (not nearly as cool as in the movie but fun to say we did it) and we wanted to ride the special Buzz Lightyear ride. As we exited from the ride we saw the entrance to Andy’s Room. We could see Buzz and Woody through the window. The line for meeting them takes you through Andy’s room and at the end you meet Woody and Buzz and exit. Don’t ask me what Andy’s room is like. I don’t know. It looked interesting but the magic wand has a powerful effect. I approached the Disney Cast member standing guard at the back door and asked for information on how we get to meet Buzz. Supergirl was in her courtesy wheelchair and that chair made the normal front entrance a bit difficult. The cast member spotted the magic wand (it’s lanyard with a Make A Wish button and Guest Assistance Pass with Make A Wish stamped on it. A small crowd had begun to gather as excitement built in the air. Something special was about to happen. One cast member spoke to another cast member who went in through the out door. The current family finished their visit with Buzz and exited not quite aware of what was about to happen. The next person in the line was told to wait. I think they felt the excitement, too. Buzz came out the out door and escorted us inside. The room was decorated as Andy’s Bed: the floor design a replica of Andy’s bedspread. Supergirl got to meet her hero. She loves Woody and he was there too. They told Buzz that he was her wish and he made it all worthwhile. We got to spend a little extra time with Buzz and Woody getting hugs and pictures. As Father’s Day draws to an end, I realize how much I miss my dad. I can’t say that he was the greatest dad in the world. He had his own demons that warred within him all of his life, but he was my dad. 7 years, 7 months and 1 day ago he passed from this life. I almost feel like I had two fathers. Oh I don’t mean two men. I mean the relationship I had with my father when I was growing up and the relationship I had with my father after I was married. It was like he was 2 different men. One of the memories that I treasure, isn’t from my childhood. In August of 1997 my twins were born. Supergirl was fighting for her life. We were being medically evacuated from Germany so that supergirl could have open heart surgery at a top US Children’s Hospital with one of the top 7 pediatric cardiac surgeons in the world. I remember being on the phone with my dad. He asked me if she really needed to have this surgery. He didn’t like the idea of his granddaughter having to undergo surgery. I broke down in tears as I told him that she only had a 50% chance of surviving the surgery but without the surgery she would die. What I remember, what stands out to me is the night we arrived at the hospital. Only Supergirl and I were allowed on the helicopter from Andrews Air Force base to the Chilidren’s Hospital. As the elevator doors opened there was my daddy. He was waiting at the hospital. My father, my mother and my sister (along with my niece) were there to greet us and give us support. Oh I was so annoyed with him. Couldn’t he have waited in the family waiting area? Did he have to be RIGHT THERE. Yes, he did. That was his daughter and his granddaughter and despite all his faults they needed him and he was there. This is a picture of my dad (I know his head is cut off!) from that hospital trip. The tiny teeny baby he is holding is RosieBear, Supergirl’s twin sister. Dad didn’t really like to hold babies. He would get nervous. But he held her and they bonded. Last week the The Old Schoolhouse Review Crew began to gather in a special forum to get to know one another. Someone had a great idea for getting to know the blogs of the crew members. Some call it a Blog walk; Some call it a blog crawl. In either case it is taking the time to read and explore a couple of blogs a day. The goal is to explore all the Crew blogs by the end of the crew year. I'm excited at this opportunity to get to know some fellow crew mates and read a wide variety of blogs. I'll be posting weekly the blogs I explore (with links) so you can have a chance to meet them as well. 1. Alane at Reaping a Harvest—Alane is an e-maginary friend I “met” years ago on a yahoo group for homeschooling. Check out her tab on Why Homeschool. 2. Lexi at Pink & Orange Coffee—I enjoyed Lexi’s humor and her blog is very organized. She has a tab just for homeschool reviews. 3. Alina at Live, Laugh, Learn!—I admire Alina. 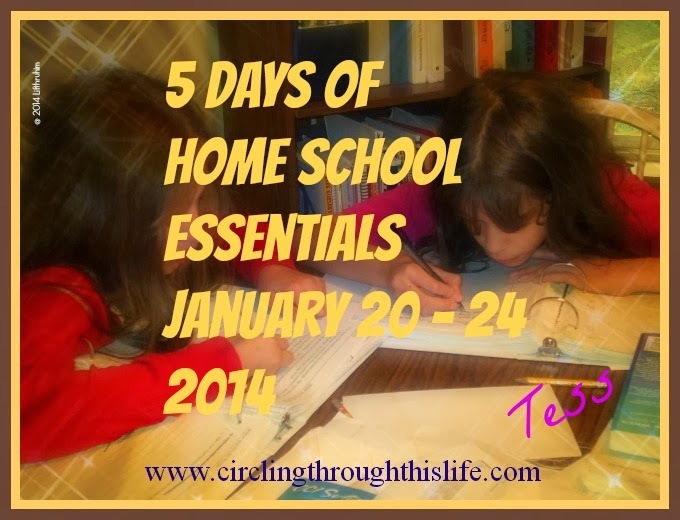 She homeschools her oldest who is also attends school. I liked her perspective. 5. Wonder Mom at The Fantastic Five – This is another very organized blog. She has some great photos of the crafts they’ve done. 6. amber at Refined Metals Academy – Amber is a homeschool parent who was herself a homeschool student. Reading her blog reminded me of when my girls were little. 7. Amy at Just A Moment in Time – She has a cooking/recipes category with a really yummy looking cake recipe that I think I’ll have to try. 8. Angela at My Journey – She has some great info different curriculum. 9. Pebblekeeper At Petra School – She has a tab set up just for TOS Crew reviews so when we get started you’ll want to check it out. On a forum I frequent, the question has come up “Why do you home school?” I think that is a great question and I think each and every family has a different answer. I think I’ve shared glimpses of our reasons for choosing to educate our children at home but, sometimes, I forget why I am doing this as I get bogged down in the pressure to make sure I cover everything and that I use the best program. I worry about how I’m failing to teach them and I get frustrated with a messy house, undone school work and I want to scream and run away. I’m sure I’ve written on this topic before. Ah here it is. I wrote about what I liked best. That hasn’t changed and yesterday reaffirmed me that what I like best is what I love most about the privilege of home schooling my children. And it is the reason I continue to home school. Yesterday, I didn’t get a lick of the academics completed that I had planned but what I did accomplish was so much more important. Yesterday, I spent time building a relationship with my daughters. Yesterday, was a day of discipleship and sharing. My girls are 14 (for a few more days), 12 (for two more months) and 11. They are as different as can be from each other. Each one has her own strengths, her own weaknesses and her own personality. Parenting them presents challenges that I never imagined! One approach works great for one but is the wrong way for another. Yesterday, I took the time to affirm and acknowledge that they are *girls* and I shared with them that I was once a *girl*. We talked about how boys are cute and what it means to hold on to your heart and not give it away. We talked about the consequences of giving away your heart too soon. I helped my 12 year old realize that it was *normal* to think boys were cute and that thinking they were cute did not necessarily mean that you were giving your heart away. We had fun as we laughed and chatted. They got to know me a little better and I got to confirm that I know them better than they think I do. It was a confirmation for me as well that yes I do know my girls. Yesterday my oldest daughter and I took a baby step away from the mother/daughter relationship and a teeny, tiny, half step towards the friends/sisters in Christ relationship. So why do I continue to home school? So that I can have those teaching moments that go far and beyond history, math, and English. I home school because I enjoy being with my children and seeing the lovely ladies they are becoming. I home school because it allows me to be a part of their life. So just a few days ago I posted about wondering where summer was. Tonight I am relaxing with my honeybear after enjoying a wonderful weekend with perfect summer weather. I really do love the temperate climate of the Pacific Northwest. My perfect summer day is not too hot and has lots of sun. Yesterday it was mid 70's. It was 75 degrees when we drove past the bank yesterday around dinner time. This afternoon on our way home from church the same bank said it was 71 degrees. This afternoon the clouds have rolled back in and the temperature has cooled off again but at least I had two days of summer! Last night we sent the girls to bed as usual. They've been staying up later and it was now past 10pm. We could hear talking and giggling. Honeybear walked down to the room shared by 3 girls and admonished them to quiet down and go to sleep. A few minutes later we heard the giggles and the talking again. Honeybear sent me down to the dark room to investigate. I discovered three girls in bed with 4 or 5 stuffed animals. That wouldn't be a problem except that the girls were enacting some type of storytelling with the stuff animals. As I held out my hand to take the stuffed animals, I said in my sternest, gruffest voice "and don't think I didn't do the same thing when I was kid and don't think your Nana didn't do what I'm doing now." They giggled. I looked at them and said "remind me to tell you about the chick a dee stories". More giggles. Then in a more normal voice, I reminded them that it was very late and they really needed to be settling down and that I had no problem if they want to go bed earlier and tell stories but if you go to bed this late, you can't have stories. I wish I could remember the chick-a-dee stories. What I do remember is my parents putting us to bed way too early and not being tired enough to sleep and my little sister being a story teller and she had this stuffed thing we called chick-a-dee. I have vague memories of him wearing a blue coat. He told wonderfully funny stories and though I don't really think my mother ever took chick-a-dee away from us I do remember her coming in and telling us to be quiet and go to sleep. I hope my children do go to bed early tonight so that they can have some time to be creative and make up stories. I hope this is a family tradition that gets passed down to my grandchildren and to my great grandchildren.